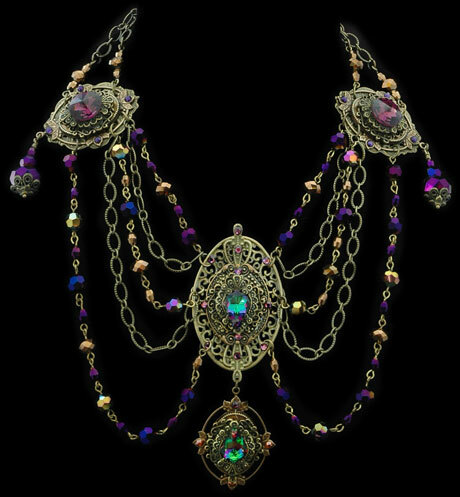 This visually stunning necklace must be seen to appreciate. My handmade chains are made up of Austrian crystals which are painstakingly pieced together to enhance this one of a kind design . The magnificent bead colors are golden bronze, deep purple, and deep purple AB crystal, all in a metallic finish which change their color in the light. The two center stones are very rare Austrian crystals which also change with the light into a rainbow of colors. These elegant crystals rest upon layers of antiqued gold filigree, and the antiqued gold etched chain finishes this lovely piece. The necklace is 7-8” at its widest point depending how it rests on your neck and the length is about 8”.